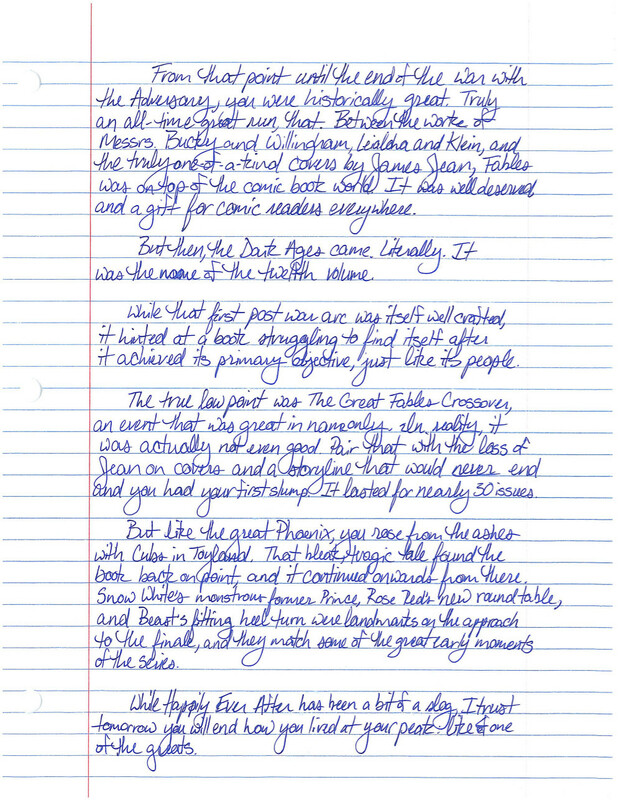 Within this article, I write a letter saying goodbye to one of the most personally influential comic series I’ve ever read: Bill Willingham and Mark Buckingham’s Fables. And by write a letter, I mean I literally wrote a letter. You can either read it in its preferred state – in letter form – or if you want to read it as an article read for web, I transcribed it at the bottom of the article. Your choice! 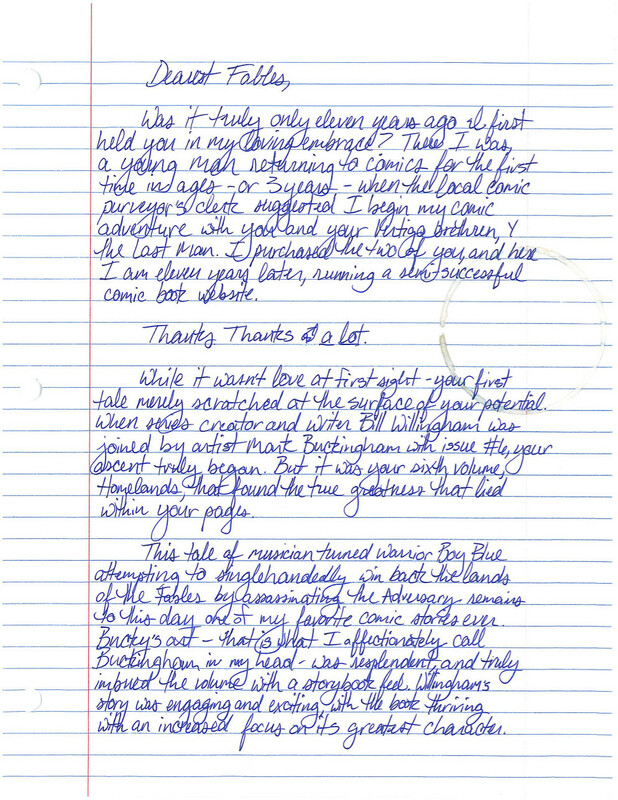 Below is the letter written for the web (and slightly edited, as it isn’t handwritten). If you’d prefer to read it in such a manner, please do. Was it truly only eleven years ago I first held you in my loving embrace? There I was, a young man returning to comics for the first time in ages – or three years – when the local comic purveyor’s clerk suggested I begin my comic adventure with you and your comic brethren, Y the Last Man. I purchased the two of you and here I am eleven years later, running a semi-successful comic book website. While it wasn’t love at first sight – your first tale merely scratched at the surface of your potential – it hinted at greatness. When series creator and writer Bill Willingham was joined by artist Mark Buckingham with issue #6, your ascent truly began. But it was your sixth volume, Homelands, that found the true greatness that lied within your pages. 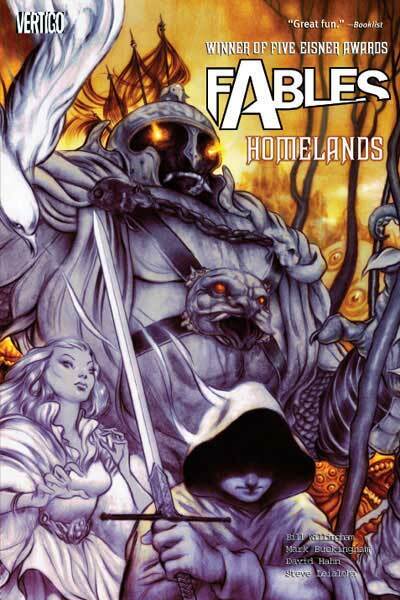 This tale of musician turned warrior Boy Blue attempting to singlehandedly win back the lands of the Fables by assassinating the Adversary remains to this day one of my favorite comic stories ever. Bucky’s art – that’s what I affectionately call Buckingham in my head – was resplendent, and truly imbued the volume with a storybook feel. Willingham’s story was engaging and exciting, with the book thriving with an increased focus on it greatest character. From that point until the end of the war with the Adversary, you were historically great. Truly and all-time great run, that. Between the work of Messrs. Bucky and Willingham, Leialoha and Klein, and the truly one-of-a-kind covers by James Jean, Fables was on top of the comic book world. It was well deserved and a gift for comic readers everywhere. But then the Dark Ages came. Literally. It was the name of the twelfth volume. While that first post war arc was itself well crafted, it hinted at a book struggling to find itself after it achieved its primary objective, just like its people. 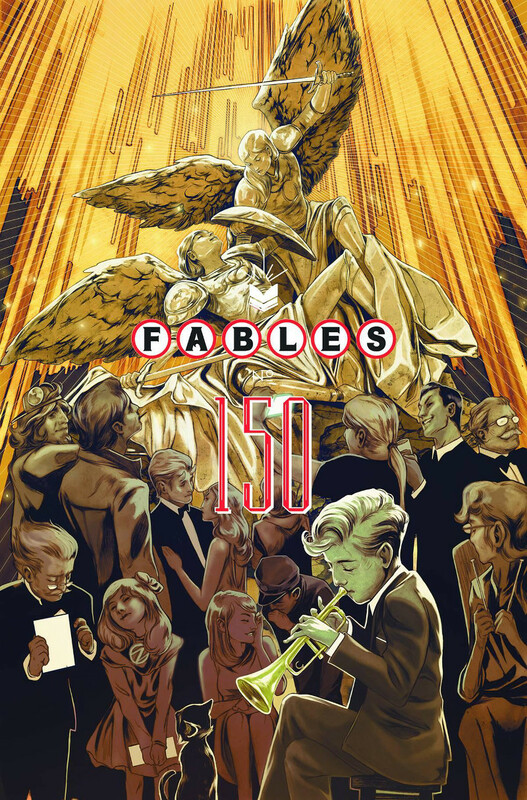 The true low point was The Great Fables Crossover, an event that was great in name only. In reality, it was actually not even good. Pair that with the loss of Jean on covers and a storyline that would never end and you had your first slump. It lasted for nearly 30 issues. But like the great Phoenix, you rose from the ashes with Cubs in Toyland. That bleak, tragic tale found the book back on point, and it continued onwards from there. Snow White’s monstrous former Prince, Rose Red’s new round table, and Bigby’s fitting heel turn were landmarks on the approach to the finale, and they match some of the great early moments of the series. While Happily Ever After has been a bit of a slog, I trust tomorrow you will end how you lived at your peak: like one of the greats. All we have left to do is say goodbye. To Blue, you’re my boy. Always and forever. 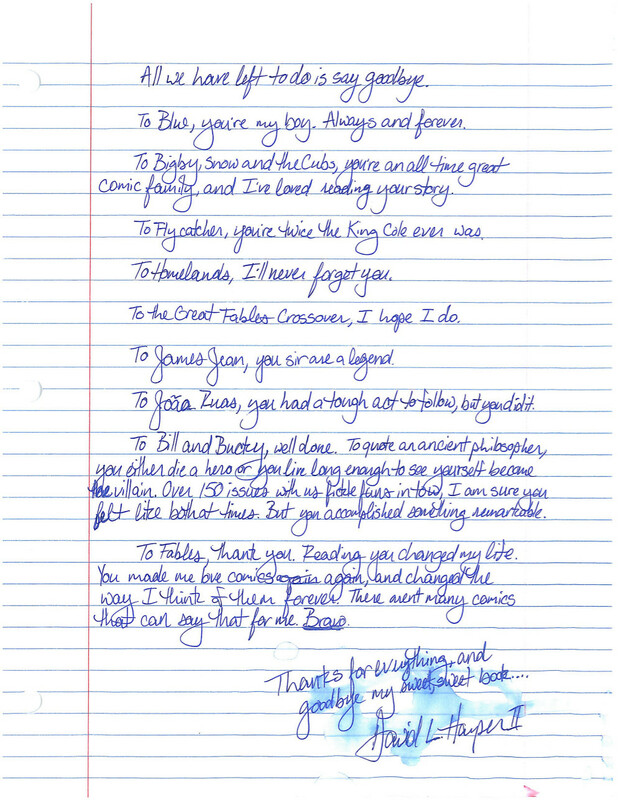 To Bigby, Snow and the Cubs, you’re an all-time great comic family, and I’ve loved reading your story. To Flycatcher, you’re twice the King Cole ever was. To Homelands, I’ll never forget you. To The Great Fables Crossover, I hope I do. To James Jean, you sir are a legend. To Joao Ruas, you had a tough act to follow, but you did it. To Bill and Bucky, well done. To quote an ancient philosopher, you either die a hero or you live long enough to see yourself become the villain. Over 150 issues with us fickle fans in tow, I am sure you felt like both at times. But you accomplished something remarkable. To Fables, thank you. Reading you changed my life. You made me love comics again and changed the way I think of them forever. There aren’t many comics that I can say that about. Bravo.